Staying up to date with current trends is critical for any successful company. Successful online marketing centers on your ability to give your prospects, leads and customers the online experience that they would expect from your business. When competitors are continually raising the bar, you simply cannot afford to lag behind. Work closely with your website provider to create a website that really stands out for and connects with your audience. Meeting all the requirements of what Google deems a great website, like on-site SEO. In case you’re planning on getting a new and better website soon, or giving your existing website a makeover, make sure you’re either extremely familiar with the latest trends, or that you’re working with people who are. A simple suggestion, yes, but it will ensure your website launch has a greater impact that lasts longer. 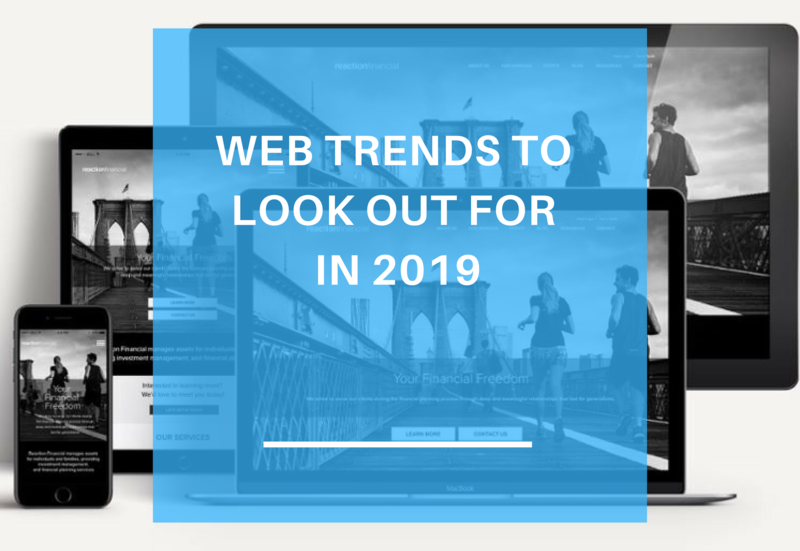 So you’re probably wondering; what are some of the web trends to look out for in 2019? Here are our predictions on trends are likely to influence your online presence in 2019. It’s in our nature to be impatient. We humans tend to have short attention spans, especially when it comes to online browsing and/or shopping. A study done by Akamai.com confirms that we do not enjoy being kept waiting (duh!) and that if a site takes 3 seconds or longer to load, we’re very likely to move onto the next one. In short, a “good” website should load in about 2 seconds - ideally even less than that. Having a pretty, sleek, beautiful website is important, but it’ll do more harm than good if it takes forever to load. If it’s too data-heavy (huge images, long forms, super-fancy layouts, etc. ), that’ll ultimately translate to revenue lost due to visitors not sticking around to see what you offer. To make matters even worse for fancy website lovers, Google recently rolled out an update aptly named “Google Speed Update” back in July, which marked the beginning of an era focusing on load speeds. Google has been handing out better scores (read: rankings) to websites that load faster. And well, when Google does something new, others follow *cough* Bing *cough*. So what does this mean for you? In case it’s not obvious yet, here’s the gist: Your web design needs to prioritize speed during the setup process. We know you want the best image possible to keep eyeballs on your site, but those eyeballs need to start seeing stuff within 2 seconds! Humongous high-resolution visuals and non-optimized videos are relics of a bygone age now. Well, that was a bit too dramatic, and while they haven’t completely disappeared, they now need to be implemented in ways that do not slow down the website. A dynamic visual is way more compelling than a static image or a wall of text. Video content - be it ads, educational pieces or whatever purpose they’re created for- has been gaining popularity over the past few years. Have you noticed how videos are prioritized over other content on popular platforms like Facebook and Instagram? You guessed it, that’s because they’re more compelling. First, the visitors will stay on your website for longer, which in turn boosts your chances of converting them. Second, the time spent on a website happens to be a key metric for SEO. The more time people spend on your website, the better your SEO will be, and the higher you will rank. Video also saves you time and space. Through the power of video, you can convey your message in a matter of seconds, whereas it would take several pages to do the same through text. This is especially useful when you only have 2 seconds or less to capture your visitors’ attention. Finally, there’s just something sleek and modern about a video background on a website. As long as the video is short, is muted, and has a nice, high-quality look to it, a video background can do a lot for your branding. Bots have been around for about 20 years, but they’ve only recently begun getting smarter thanks to ever-improving artificial intelligence (AI) and machine learning. Google especially, has been leading the way in incorporating these bots into our daily lives. Those autosuggestions you see when you’re searching for something on Google? Yep, that’s a bot. Similarly, Facebook has also been tapping into the power of AI to show us ads and events based on our location, and photos based on what we look like (that’s a bit creepy isn’t it?). And all of this to get a “like” or a click. Chatbots are what you’d call an “advanced bot”, as they are smart auto-responders on your website that serve as customer support or even a sales agent. Before you or your sales team even join the conversation, these bots backed by machine learning can get the conversation going, gather their information and prepare them for your finishing touches. We predict in 2019 that we will see a ton of new developments in this area. In the very near future, website interactions will be 100% seamless. It could get to the point that when someone visits your website for the nth time, the AI behind the scenes can actually customize parts of it based on the person’s past interactions. Remember when mobile search took over desktop? That was in 2015. And it’s been growing ever since. People are always on their phones; lunch-breaks, on the train, the bus, the elevator, even in the bed! To nobody’s surprise, mobile search has been growing explosively in the past several years. In accordance with this, Google started looking more favorably on sites that are mobile-friendly over the ones that aren’t. As a result, we see a new trend emerging: mobile first. 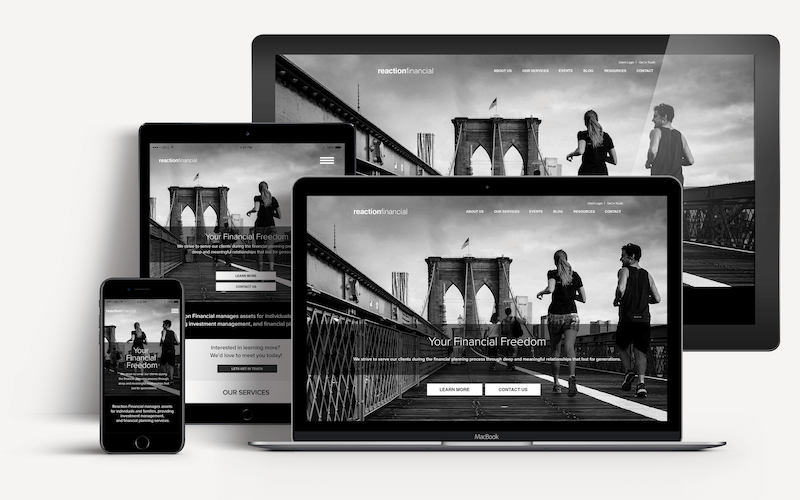 Mobile first web design is a new standard, that’s changing the way websites are fundamentally designed. 10 years ago, designers would build the site for a desktop or a laptop computer and mobile responsive would be added later. With the emergence of mobile first web design, this approach has been completely reversed. Now it’s the mobile version that’s created first, and only then the desktop version is built. Mobile First and AMP demonstrate a very strong push towards mobile. The important thing to realize here is that this push is not just for SEO purposes. The whole point of mobile is to improve and enhance the users’ experience with websites. Given the mobility of users today, the mobile first trend looks like it’s here to stay. You’ve probably used the Google Assistant, Alexa, Siri or even Cortana recently, or at the very least witnessed someone use one of them. 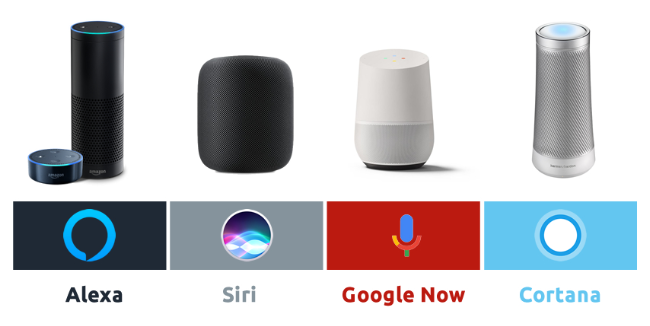 These are voice activated assistants developed by major companies. As technology advances, we get lazier and lazier, and these voice assistants run to our rescue. Too tired to sit up on your bed, fire up your browser and type something on Google? No problem, just activate the Google Assistant and it’ll get the job done for you. 2019 will be a very interesting year for web design... On one hand, we see the focus shifting towards simple, to-the-point, fast design elements, whereas on the other we see complicated components like AI on the back-end, or more tempting visual elements like videos tailored to boost conversions. With changing trends, both the industry and our approach to prospects take on new forms. What’s going to make you stand out from the competition is staying on top of these trends, or at the very least working with people who are well-versed in them. At Advisor Websites, we help financial advisors stay up-to-date in the digital landscape by providing only the best-in-class technologies complementing their businesses. Our robust platform allows financial advisors access to tools that are no longer considered a luxury, including a lightning-fast website builder, content library with scheduling and social posting options, lead manager among many other immensely useful features. Advisor Websites™ is a global leader in website software for the financial and insurance industries. 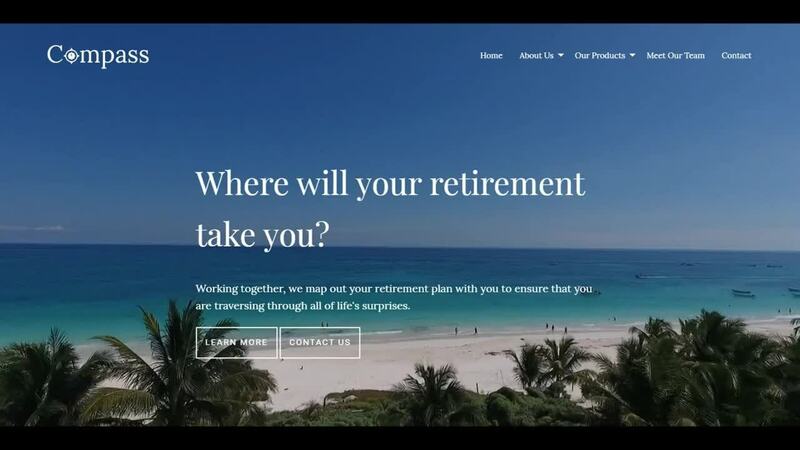 Our award-winning web-based platform is used by professionals including Financial Advisors, Registered Investment Advisors (RIA), Certified Financial Planners (CFP), Insurance Agents and Brokers to create and manage compliant and user-friendly websites. ©2019 Advisor Websites™. All rights reserved.